Have you ever wondered where the traditional Burns Night celebration comes from? It is a tradition, upheld by many throughout England and Scotland, to commemorate the poet Robert Burns' contribution to Scottish culture. The 17th century poet penned hundreds of songs, letters and poems over his short lifetime of only 37 years. One of his most famous works is Auld Lang Syne, a song often featured within a traditional Burns Supper, which is celebrated on Burns birthday on 25th January. Audley Villages are celebrating it too. Aye we are! Audley Villages will be joining the celebration and hosting a Burns Night three course supper from 6pm at our restaurants in the North, Midlands, South East and South West of England. Find out more about Audley Villages restaurants. This sample Burns Night menu (above) is available at Aldwyn's at Ellerslie, in Malvern, from 6pm. Which translates to "May you live long and keep well". There are many Scottish sayings you may recognise, even if you're not Scottish. Have a bonnie day and please do share your memories and tales of Burns Night on Audley Villages social media channels. Audley Villages restaurants host a traditional Burns Night Supper on 25th January, including (of course) Haggis and plenty of Whiskey. 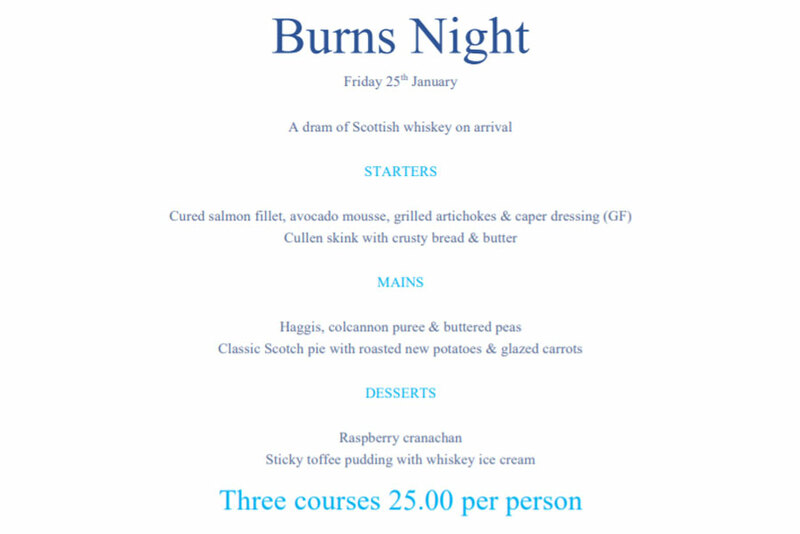 Book your Burns Night three course meal from £25 per person (prices vary by menu and location).